We have gained a remarkable position in the industry by offering a qualitative assortment of Semi Automatic Chyawanprash Filling Machine. This filling machine is appreciated among customers due to its less maintenance & easy installation. The offered filling machine is developed by our experts utilizing high quality of material & modern techniques. 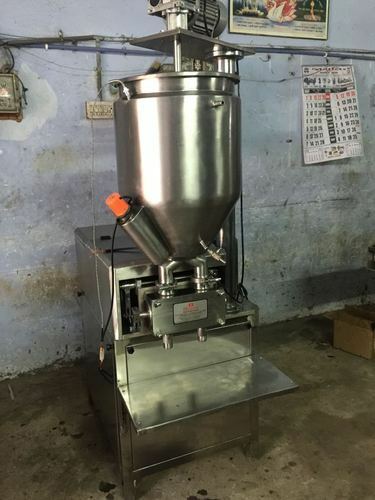 As well, we are giving this filling machine on numerous specifications so as to meet the demand of customers. Since 2001, we " Bhavani engineering works" have been recognized as a prominent manufacturer and trader of Cream Filling Machine, Chyawanprash Filling Machine, Jar Filling Machine, Pickle Filling Machine, Gel Filling Machine to our clients. All our machines are manufactured in compliance with the industry quality standards and are highly acknowledged for their features like sturdy construction, reliable performance, and low maintenance cost. Moreover, the conveyors offered by us are manufactured using the high quality raw material. Furthermore, we have got the Trade Membership of Ahmedabad Engineering Association. A sound and technologically advanced infrastructure facility are developed by us at our base, which aids us in carrying out all our trade activities in a dexterous manner. The infrastructure of our firm is installed with advanced machines and tools that are required for bulk production. Moreover, for having streamlined working of our infrastructure, we have recruited a team of dexterous professionals. All the machines and conveyors developed by us are ensured of longer service life and are stringently examined by our quality auditors on varied parameters. Owing to the perfect pool of diligent employees along with the advanced infrastructural facilities, we have mustered a large number of patrons across the nation.